This week’s veg box from Riverford contained a large bag of spinach. Now, there are two recipes for creamed spinach in The Prawn Cocktail Years, both very different. I decide to make the first, and simplest, of the two, which basically has you cooking the spinach slowly in a pan and then adding butter. 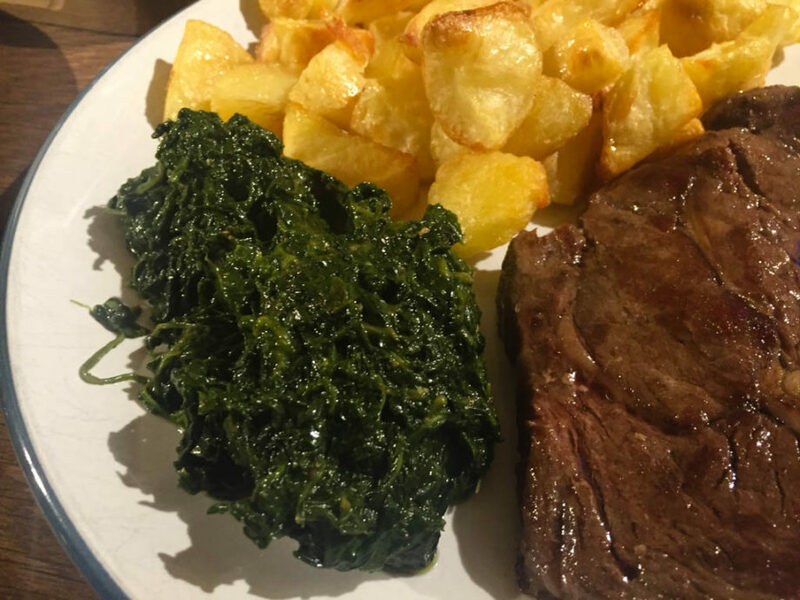 I figured I had plenty of spinach for the two of us, but when I take a closer look at the recipe I see that it serves four and requires a whopping 1.4kg of spinach. I weigh my ‘large’ bag – that came in at 350g. Now, I do quite like spinach, but 1.4kg for four people? That sounds like an outrageously large amount of spinach. I was sure my bag would be more than enough for two people, I’d just scale the recipe down. 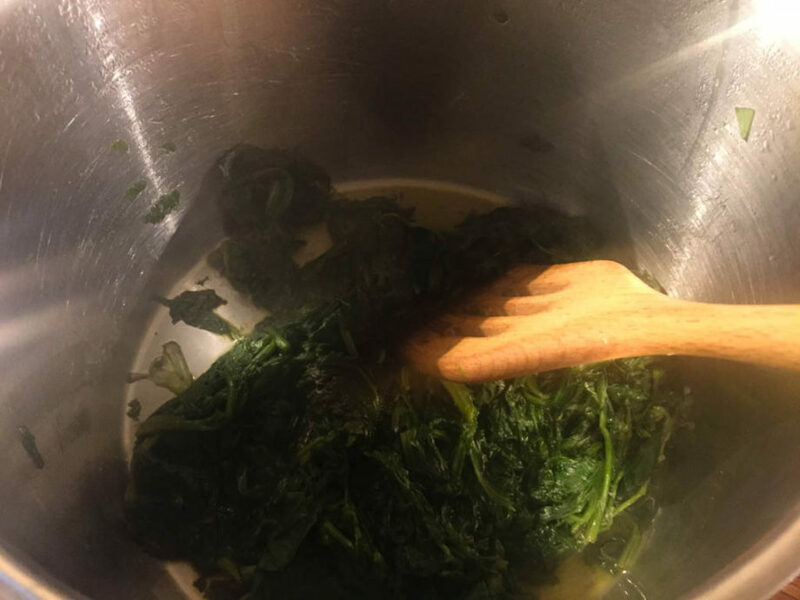 So, I wash and dry the spinach and place it in a large pan, cooking it gently for twenty minutes or so, stirring periodically. 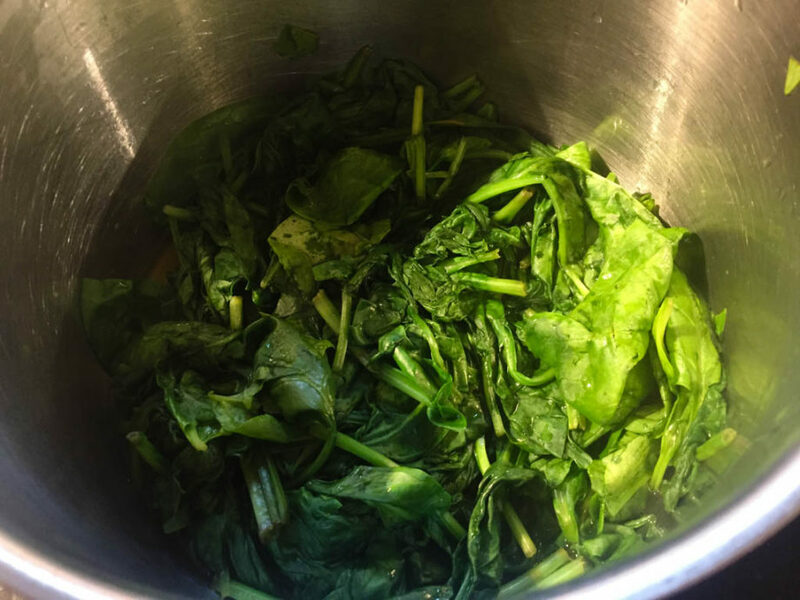 Then, I add butter in small amounts, stirring well after each addition so that is all gets absorbed by the spinach. After another fifteen minutes, a little seasoning, and we’re done. Thirty five minutes to cook a pan of spinach? Who’d have thought it? I serve it to accompany some steak. It’s not bad, certainly better than I thought it would be. 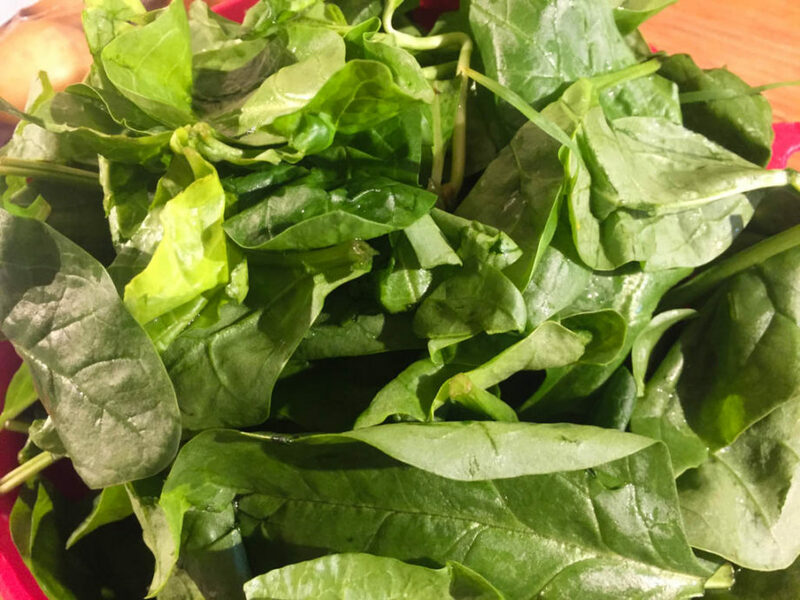 It has a darker, richer flavour than I’d normally associate with spinach, but buttery and creamy with it. I like it. And as for the quantity? Well, my meagre bag of spinach provided two very generous portions. All I can say is that Simon Hopkinson and Lyndsey Bareham must really like spinach. I like spinach. But it barely needs cooking. I also like it cooked with other things, cream, cheese, spices etc. So creamed spinach sounded nice to me. But it was only very so-so. And because it had been cooked for about 25 minutes it was like slimy mush really. I think our tastes and skills in vegetable preparation and cooking has improved somewhat since this book was written. No longer do we live in the time when my Great Aunt came up to visit Mum on her birthday, announcing that she could not stay too long before she set off to walk the 3 miles back home that she had just walked for the visit because she’d left her carrots on low! I suspect she might have approved of this spinach. The title “creamed spinach” meant I expected it to be unctuous. But it wasn’t really. There wasn’t any cream in it. Just butter. And somehow, not enough butter to repair the damage of 25 minutes of cooking or whatever it was. Not one I’d ever order again sadly. I ate it all, because I like and want way more veg in my life than Dave does so I have to hoover up any that get proffered. But it wasn’t a particularly pleasant experience.